Yesterday, Manhattan's Union Square Park was the site of a massive pillow fight. Hundreds of New Yorkers took out their aggression on their fellow citizens--using feathers and foam rather than the traditional elbows and fists. As much as I would have liked to whop a stranger or two, I had to skip the fight. But given the success of the event, there's sure to be another one next year. 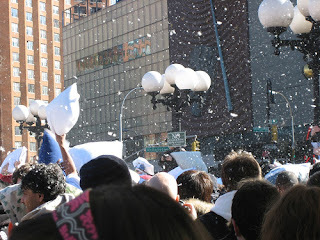 For pictures, as well as a video of the 2006 NYC pillow fight, click here. that looks like so much fun!! although with glasses i'd be on the more cautious side and contacts would dry really fast in a situation like that, plus i was in Boston any way so i couldn't make it. i wish i could have been there... im going next year!